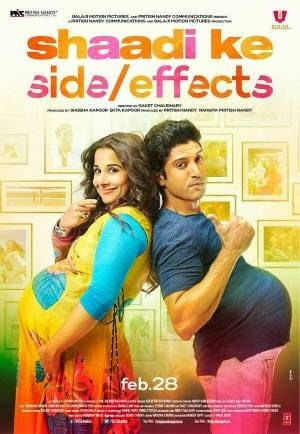 Shaadi ke Side Effects is all about how Sid and Trisha deal with what they are in real and what is expected out of them. It is about how they respond to the unplanned situations that life throws at them. They have two options – To either accept it or run away! Siddharth Roy (Farhan Akhtar) is reluctant to grow up although he is married and has a baby. Trisha Mallik (Vidya Balan) welcomes motherhood with open arms and flows with the time. It is this difference between them that makes the interesting plot for this movie! I thoroughly enjoyed how the opening opens. It is different and extremely interesting. I loved the Desi Romance song. The entire first half is very unique and funny. There are many-many laugh-aloud moments. But the second half becomes repetitive and a little too boring. That is when as audience, we start questioning everything. Can a father be so irresponsible? What would happen if a mother runs away from responsibilities by giving lame excuses? What is wrong with Sid? And so on…. And that’s when the movie starts becomes tiresome. To add on to the frustration, a misplaced Harry is not Brahmchari will blare! The movie is long enough to become boring. Second half should have been well-edited and shortened. The songs are not catchy. But they are well-choreographed – Saving grace! All said, Vidya Balan fit into the skin of Trisha. The entire movie is from the point of view of Sid. Yet, she shines. She is wholesome and I liked her loose-fitting dresses. I read many criticism about her weight and her costumes. But, I personally liked her. Come on, 8 on 10 women are fat; to put it differently, they are not skinny or with flawless body. So, I liked Vidya and her costumes. The movie is about Sid. Farhan Akhtar has delivered a convincing job. The confusion, the desire to grow up yet the fear of growing old, the compulsion to give up dreams, the attempts to attract his wife’s attention and the loneliness are well essayed. Ram Kapoor as a perfect family man… Ila Arun as a nosy yet good-hearted aunty… Rati Agnihotri as a caring mother… Purab Kohli as the helpful neighbor… And Vir Das as a carefree chap…None of them have much to do except to stand by the main protagonists. But they do their bit well! In short, the movie is a one-time watch with lots of laugh aloud moments… Married or not, you will enjoy! Go for it. But don’t forget to keep your thinking cap at home! So... you dont really have to feel jealous! The 1st half at least!